Parmigiano Reggiano is a cheese that’s produced in only one area of Italy. Anything that's not from that heart shaped region between Parma and Reggiano, separated by the Po River from Lombardy, is not the real McCoy. If you take the tour of the Ciaolatte factory in Borghetto, you'll learn that there are three ingredients to a recipe that produces deceptively rocky crystals that easily crumble in your hands. Rennet, which is the intestine of a baby calf, provides the enzyme that creates the inner life of the cheese which takes about 3 years of aging before it’s ripe enough to be eaten. Cows have to be milked twice a day and so the cheese is produced 365 days a year with the milk from the night before, a form of skim milk or whey, which lies in trays, rolling into copper cisterns which are then filled with fresh milk, rennet and salt. Each cistern produces two wheels of cheese. 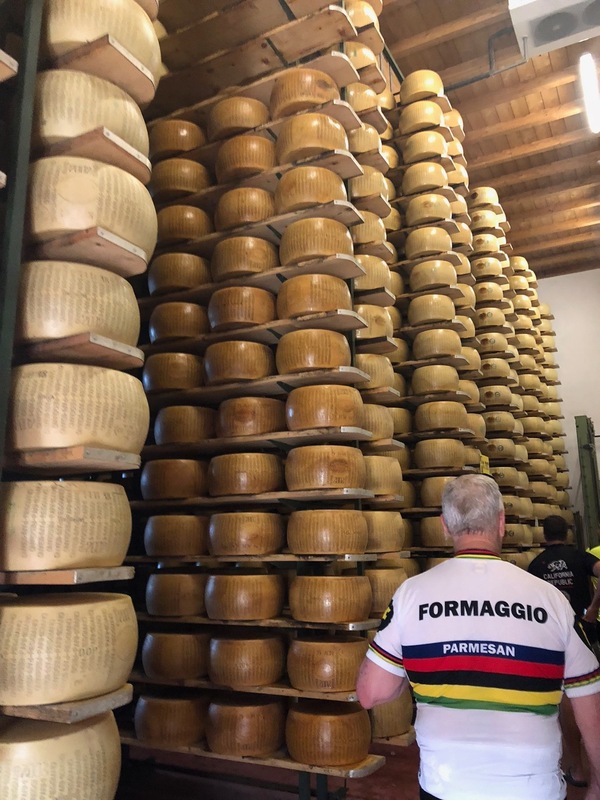 The cheese eventually is housed on shelves in a huge refrigerated warehouse where it has to meet strict regional inspection standards before it's sent out into the world. A short while back one of the cheese warehouses had been broken into, but the cheese was recovered when the getaway vehicle broke down. That’s about as complicated as the life of a Parmigiano Reggiano cheese wheel gets.